This publication summarizes the process of pollination in different vegetables and fruits grown by the backyard gardeners of North Dakota. Successful pollination is needed for fruit or berry production. The role of pollinators in growing vegetables and fruits is summarized as well as best management practices to attract and protect pollinators. Bees are important insect pollinators for bountiful home vegetable gardens and backyard fruits. European honey bees and native bees, such as bumble bees, help ensure fruit set and higher yields. Learning about the process of pollination can help smart gardeners attract and safeguard these important insects. Pollination is the deposit of pollen grains from the anther (male structure) onto the pistil (female structure) of the same plant species (Figure 1). 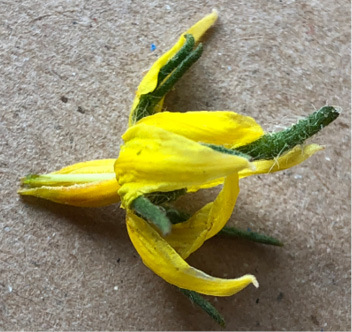 Pollen can be transferred within an individual flower or between separate flowers. Successful pollination results in the production of viable seeds and a fruit. Most crop plants are pollinated by insects or wind. Many agronomic crops, such as wheat and corn, rely on wind pollination. In contrast, many fruits and vegetables require or benefit from insect pollination. Common insect pollinators include bees, butterflies and flies. Of these pollinators, bees are the most important in the home garden. Common plants in the cucurbit family include garden favorites such as cucumbers, squash, zucchini, pumpkins, watermelon and muskmelon. Most cucurbits depend on bee pollination because each plant produces separate male and female flowers rather than having both sets of reproductive parts in each flower. Such flowers are called “imperfect.” Bees are essential to cross-pollinate, or carry pollen from the male flower to the receptive female flower. The cucurbit male flower contains three to five stamens with pollen-producing anthers. The female flower produces a single style with three stigmas. The easiest way to distinguish between the two flower sexes is to look for an ovary below the yellow petals. Female flowers have a swollen ovary, or fruit, and male flowers do not (Figure 2). Gardeners frequently ask why they have so many flowers on their cucumbers but no fruit set. Look closely at the flowers to answer this question. In many cucumber cultivars, the first set of flowers are all male, which do not bear fruit. Male and female flowers then will be produced in the second wave of blooms. If female flowers are present but no fruit develops, then the problem may be a lack of pollinators. In the short term, you can fill the role of the bee with hand-pollination. Take a clean paintbrush and insert it into the male flower to gather pollen. Then transfer pollen to the stigmas of an open female flower. Hand-pollination works best in the morning. For a long-term solution, create pollinator habitat near or in the garden to attract bees. 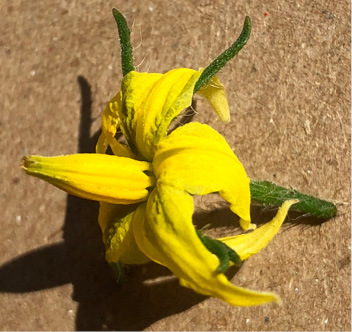 In contrast to cucurbits, Soloanaceae crops such as tomatoes, peppers and eggplants produce “perfect” flowers that contain male and female reproductive structures. 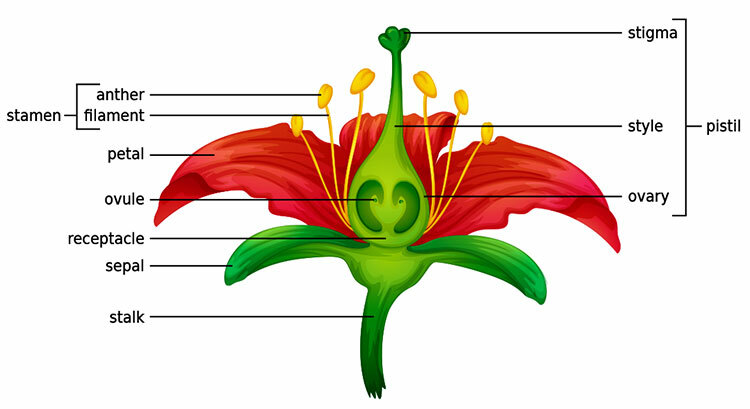 Flower anatomy differs from the idealized image in Figure 1. Tomato anthers form a tube that completely surrounds the pistil (Figure 3a). In Figure 3b, the anthers are partially removed to reveal the pistil. Tomatoes, peppers and eggplants can be pollinated simply by wind shaking the pollen from the anthers onto the stigma. However, bumble bees can improve fruit set and size because they vibrate the flowers and shake pollen loose from the anthers. Leafy greens (lettuce, spinach, arugula), cole crops (cabbage, broccoli, cauliflower, kale), root crops (carrots, beets, radishes, onions), legumes (peas, beans) and tuber crops (potatoes) do not require bees to produce an edible harvest. Bee pollination is particularly important for growing tree fruits and small fruits. Many tree fruits such as apples and pears are self-incompatible (Table 1). This means two separate cultivars must be planted to produce fruit. For example, a ‘Honeycrisp’ apple blossom will not set fruit if a bee deposits pollen from a second ‘Honeycrisp’ apple tree. Instead, the pollen must come from a cultivar that is genetically different and has an overlapping bloom time. Fruits such as sour cherries are self-compatible and can set fruit in the absence of a second cultivar (Table 2). However, self-compatibility still requires bees to transfer pollen within the flower or between flowers for full pollination. The number of cherries on a tree is directly related to the number of bee visits. 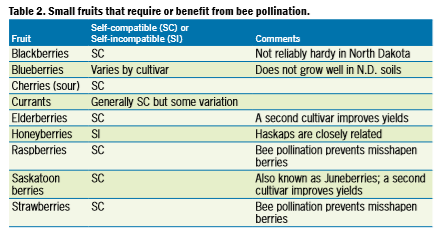 Raspberries are another example of a self-compatible fruit that relies on bees for full pollination (Table 2). The average raspberry flower contains 100 to 125 pistils. To produce a normal berry that does not crumble, at least 75 to 85 of the pistils must be pollinated. Plant native and other well-adapted flowering plants for seasonlong bloom in or near the garden. Create nesting habitat for ground- and cavity-nesting bees. Do not spray insecticides or fungicides on flowering plants or fruit trees just before or during bloom. If pesticide applications are necessary, choose a product with the least toxicity to bees. Kalb, T., and K. Wiederholt. 2017. Starting a Community Orchard in North Dakota. NDSU Extension publication H1558. Klein, A.M., B.E. Vaissiere, J.H. Cane, I. Steffan-Dewenter, S.A. Cunningham, C. Kremen and T. Tscharntke. 2007. Importance of pollinators in changing landscapes for world crops. Proceedings of the Royal Society B 274: 303-313. McGinnis, E., J. Knodel and T. Weinmann. 2016. Bee-utiful Landscapes: Building a Pollinator Garden. NDSU Extension publication No. H1811.